Condensation damp is a common and irritating problem for 1 in 4 homes across the UK, especially at this time of year. 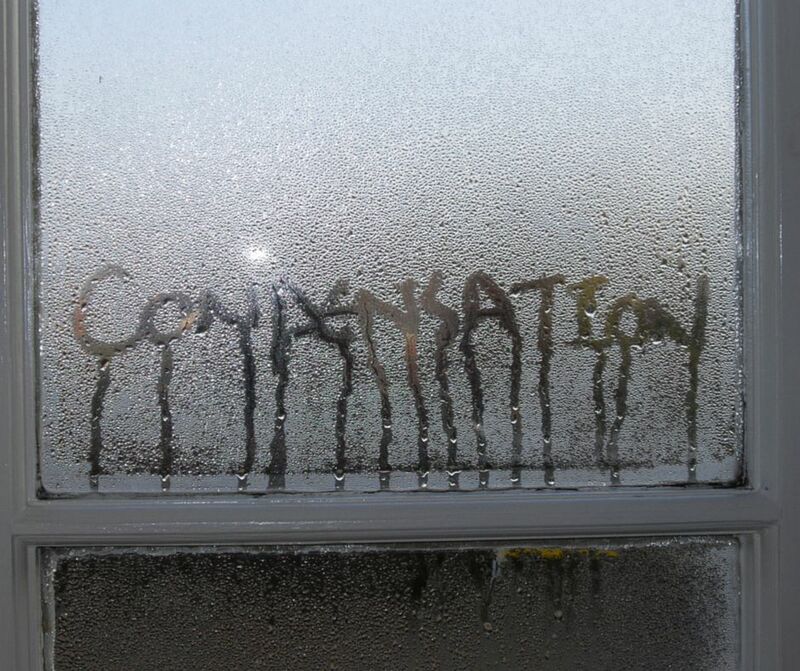 Condensation is caused by high levels of humidity in the air becoming trapped within your home. This is particularly common in older properties that have gone through renovations to conserve energy. I.e. home improvements such as loft insulation, installation of new windows, blocking up open fireplaces. The property becomes sealed which, whilst great for energy efficiency, encourages moisture we create from every day activities like cooking and washing to stay trapped within it. Warm air holds more water vapour than cool air. As the air warms its molecules move farther apart, making room for more molecules. When temperatures drop moisture that is held in warmer air is discharged and lands on cooler surfaces, creating a condensation problem. You may notice this on windows early in the morning or, where the windows are warmer than the wall, areas of the wall may drip with condensation. When loft insulation is insufficient, a build up of condensation could appear in loft spaces. This is important to monitor as it could lead to long-term timber problems. If the relative humidity levels within the property are very high then black mould will grow. A healthy home will have levels of relative humidity somewhere between 45-55%. Black mould will start to form if relative humidity levels are at 80% or higher for 6 hours or more. Not only is mould unsightly and damaging to the fabric of a building, it has also been found to aggravate breathing and skin conditions, such as asthma and eczema. If you have a problem with condensation, you’re likely to also have a problem with dust mites. Dust mites thrive in humid conditions, as their only source of water is from the air. This means that if there are high levels of relative humidity in a home it’s the perfect breeding ground for dust mites. The higher the humidity, the quicker they will breed.One of the main triggers in aggravating asthma symptoms is the house dust mite and their droppings. Researchers estimate that these microscopic creatures may cause up to 80% of asthma attacks as well as countless cases of eczema. Poor indoor air quality, normally attributed to lack of effective ventilation, can lead to dizziness, headaches, coughing and sneezing, difficulties breathing, dry skin, throat and eyes. Moreover, air pollution can be extremely harmful to health, leading to breathing issues, allergies, asthma and chronic pulmonary disease. How can I tell if I have a Condensation Damp problem? Once you know that you have condensation, you can begin to think about the best condensation treatment to take. You can also rule out other damp problems such as rising damp or penetrating damp. If you invite a surveyor to assess the problem, it’s important that they are experienced in all types of damp – including condensation. Whilst the best approach to any damp issue is to organise a professional treatment, there are also things that you can do yourself to help minimise the chance of damp condensation in your home getting worse. With the exception of over-crowded properties, there tends to be three major factors that contribute to condensation: inadequate heating, poor insulation or insufficient ventilation. Examples of these are listed below. Ventilate your property. Open windows regularly on both sides of the house to allow the air to pass through the property. Keep vents open and if you have a blocked chimney, ensure there are at least two grills fitted for air flow at the top and bottom of the chimney stack. Maintain a consistent temperature. Cooler temperatures cause the moisture that is held in warm air to disperse onto cold surfaces. Ensuring these colder surfaces remain warmer will help prevent condensation problems. Ensure your home is well insulated to prevent heat from escaping. Loft insulation is particularly cost-effective. The payback is approx 2-3 years. You’ll prevent condensation settling on your loft timbers and save money on your heating too. Reduce condensation and moisture in the air by drying clothes outside where possible or ensuring that your tumble dryer’s ventilation pipe runs to the outside of your property. If you must dry clothes indoors, avoid the radiators and instead dry them in your bathroom with the door closed and the extractor fan on or window open. When you’re cooking on the hob, keep pan lids on, close the kitchen door and keep the extractor fan on during the time you are cooking and for at least 15 minutes afterwards. When bathing or showering, keep the bathroom door closed during and afterwards, open the window and have the extractor fan on. Remember, if your extractor fan isn’t strong enough to hold a card up to it when it’s switched on, it needs servicing or replacing as it won’t be doing it’s job. Pull your furniture slightly away from your walls to ensure the warm internal air can move freely around. Condensation and black mould likes to settle in cold places. Try a dehumidifier – this is a suitable solution if you have condensation problems in just one room. They tend to be bulky and expensive to run but if you have space and remember to empty the water content regularly, it will ease the problem. Use mechanical ventilation. If you are concerned about poor indoor air quality, black mould or condensation on a daily basis throughout the cooler months, then mechanical ventilation is the permanent solution. Fresh air ventilation systems gently push fresh, low-humidity air into the property. This, in turn, forces out stale air and maintains a healthy level of relative humidity, preventing condensation from forming on any surface. This guide was produced by Nathalie Rush – Managing Director of West Midlands based Home Insulation, Ventilation and Damp Proofing experts Six Star Group. Finesse Windows have worked closely with Six Star on a number of projects and would always recommend any of our customers contacting them if they have any concerns. If you would like more information then please speak with one of our Design Experts on 0121 451 3724.